Popular portrayals of scientists often have them toiling away in an isolated lab, laser-focused on their research and objective to a fault. But for some San Francisco State University students, science for science’s sake isn’t enough. 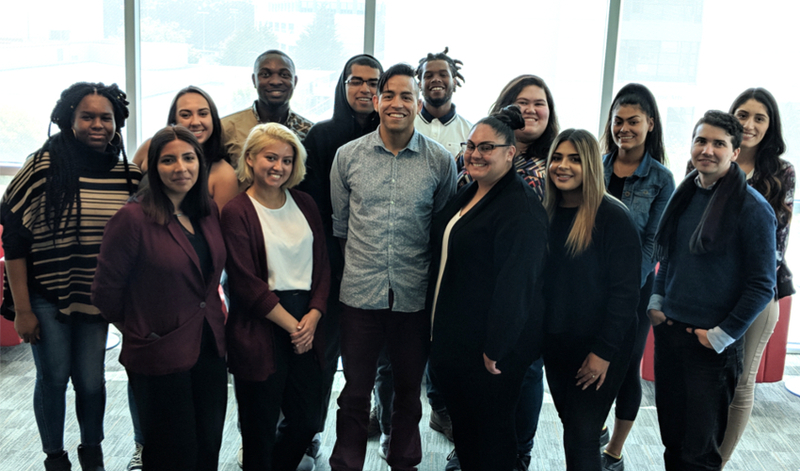 The SF BUILD Scholar program aims to give socially conscious students the resources to do research that connects to their community, from coming up with a research idea and doing the experiment to getting the word out about what they discover. Last summer, the students spent nine weeks in a research training program. Now they’ve taken the next step by finding spots in research labs at San Francisco State and UCSF. Here’s what three young scientists in the most recent class of scholars are learning from the program and how they’re combining their commitment to social justice and their research. Thai Hill, a mechanical engineering major, has a practical view of how he wants to use his degree. “If engineering is supposed to be the cutting edge, the cutting edge is typically expensive and inaccessible,” he said. Instead, he wants to make the technology “accessible to the people who need it the most.” This semester he started pursuing that goal by working on low-cost prosthetic technology in the lab of Assistant Professor of Mechanical Engineering David Quintero. What stood out to Hill about the BUILD Scholar program was the ways in which students were given agency to shape the way they learn. Students and instructors laid out “community agreements,” a form of classroom consensus-building that Hill says he was familiar with but had never seen before in his science and engineering courses. “Talking about how we all learn best and how we want to be respected, that was a big thing,” he said. Psychology major Jake Gibson came into the program with research experience, but hearing socially conscious researchers speak about their work gave him a new roadmap for how he wants to approach science. “It showed me that you can do research and still have a connection to the community,” said Gibson, who works in the research labs of Associate Professor of Psychology Amy Smith and Professor of Psychology David Gard. Gibson hopes to find ways to make mental health tools more available to more people. “Can a current mental health intervention be done cheaper, in a way that’s more accessible?” he said. For Gibson, that could mean new ways of helping people who struggle with mental health, such as mental health apps or online therapy. After watching the parents of several of her friends receive cancer diagnoses, physics major Alexandra Shiffer decided she wanted to find a way to use her degree to fight the disease. That led her to radiation oncology, which she now researches in the lab of UCSF Associate Professor of Radiation Oncology Jean Nakamura. After hearing doctors in the BUILD Scholar summer program talk about how their work relates to their community, Shiffer realized she needed to ensure that the results of her research are relevant to underserved groups. That meant making her findings available to groups that have less access to health care, like her mostly Hispanic community in South San Francisco, by directly communicating the results to the community. “You should be seeking the people who need help first. It shouldn’t be the other way around,” she said.